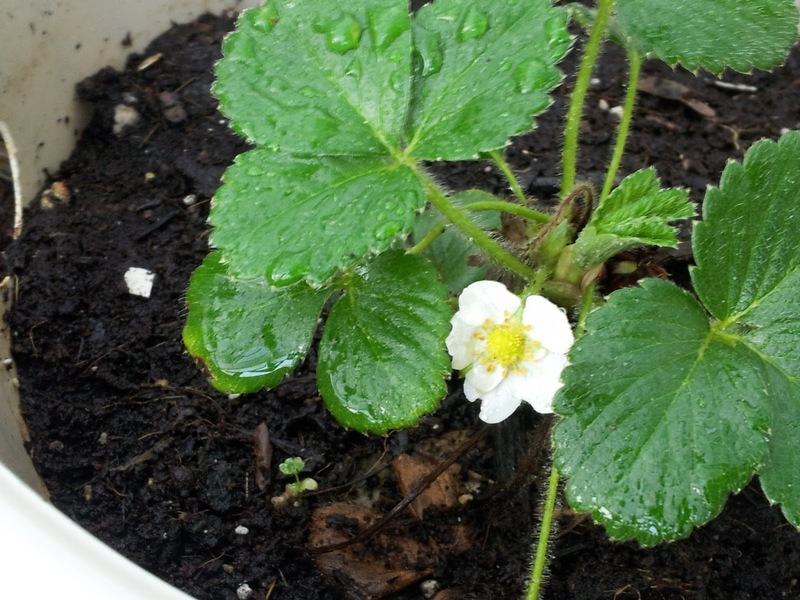 Strawberry plant by Fran W.
There are some very interesting ways to grow strawberry plants! In addition to growing strawberries in a traditionally raised bed, they can be grown in towers, containers, in unusual planters, in a hanging planter, upside down, in soil or hydroponically. Talk about a versatile plant! Strawberry plants can be purchased in garden stores and come in a variety of types, but if you’re interested in starting your own plants, there are a couple of ways to start them from the strawberries you purchase in the store. To grow strawberry plants from seeds or achenes, you can carefully remove them from an over ripe strawberry with tweezers, or by scrapping the skin lightly with a knife, or a fingernail. Another way to extract the seeds is to put a strawberry into a food blender, along with 2 cups of water, and run it on the lowest speed for 10-30 seconds. Allow the pulp to float to the top, pour it into a cup, and harvest the seeds on the bottom of the container. You may need to blend the berry a little longer to get the seeds to separate and that’s okay, run the blender on a low setting, this way you don’t damage the seeds. Tip: Make strawberry lemonade out of the pulp water by adding some fresh lemon juice and sugar (to taste) to the cup. Whatever method you choose to use, put the seeds on a paper towel and allow them to dry out. If you’re not planning to use them right away, store them in an airtight container in the refrigerator until you’re ready to plant them. If you don’t want to collect seeds yourself, they can be purchased from a garden center or on line. Put dry seeds on a moistened paper towel and place in a zip-top bag in a sunny location. Keep the paper towel damp and the bag closed. When you see sprouts beginning to form green leaves, carefully remove the seedlings and plant them in small containers filled with fresh, nutrient-rich soil. Put the seedlings in a sunny place and keep the soil moist until they are ready to be transplanted into a garden. The seeds can also be started in containers filled with nutrient-rich soil. Put your containers in a sunny location and keep the soil moist. When your seedlings are ready, transplant them into a garden. Note:It can take 2-3 weeks for the seeds to germinate and they may not germinate all at once but a few at a time. Tip: Recycled yogurt cups or egg cartons make good seedling starters. Activity suggestion: While you’re waiting for your seeds to germinate, think about the type of strawberry garden you would like to make when your plants are ready to be transplanted. Would you like to make an unusual planter, grow them hydroponically or stick to the traditional strawberry beds? How will you protect your strawberries from the animals that eat them? Here are some strawberry You Tube videos that you may find helpful. This activity is part the Strawberry Craze series. A yummy and fun way to start the day or enjoy as an anytime treat. Find out how strawberries have been used over the centuries and make strawberry hull tea. Learn about strawberries by using your senses. Find out how to extract DNA from a strawberry using simple household items. More strawberry related activities can be found in my ebook Strawberry Craze. This 91 page ebook is filled with 30 strawberry-related activities and 15 yummy, kid-friendly recipes. Click to learn more.